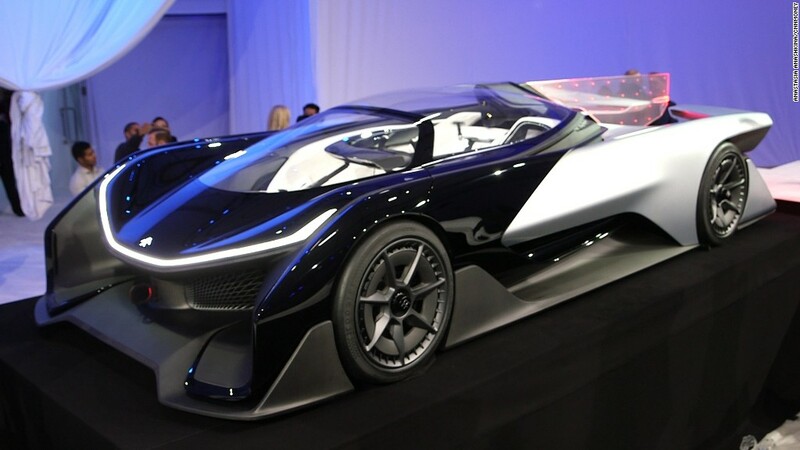 Faraday Future, a secretive California automaker, unveiled its first concept vehicle at the Consumer Electronics Show in Las Vegas Monday night. The FFZero1 concept is a sleek single-seat all-electric sports car that could, according to Faraday, produce as much as 1,000 horsepower. The car itself offers little clue as to what Faraday's first production car will look like. That car, which should go on sale in two years, is expected to be more conservative and practical than the exotic looking FFZero1. But this concept car does offer a look at how Faraday plans to engineer its cars. The FFZero1 is based on a flexible chassis that can be made longer or shorter to include a varying number of battery packs (and thus different sized cars). The chassis is designed to accept from one to four electric motors, creating cars that are two-wheel or four-wheel drive. "You don't have to sacrifice anything for being sustainable," said Richard Kim, head of design for Faraday Future. "This is a 100% sustainable, electric, non-polluting vehicle, and it can be as dynamic as 1,000 horsepower." Kim previously worked for BMW where he helped designed the German automaker's i3 and i8 plug-in cars. Faraday has also hired engineers and designers from companies like Ferrari and Tesla Motors (TSLA). Faraday is promising to build "increasing levels of autonomy" into its vehicles so that, eventually, it will be able to create fully self-driving cars. The company, which is backed by Chinese investors, plans to build cars in a new Nevada factory. So far, Faraday has been secretive about its top-level leadership and has never publicly named a CEO. General Motors (GM) is also expected to unveil the production version of its next all-electric car, the Chevrolet Bolt, at CES this week. Correction: An earlier version of this article incorrectly reported that an internal combustion engine can be added to Faraday's cars.